On the Care for our Common Home is the Pope’s Encyclical Letter on the environment and human ecology. “Christians in their turn ‘realise that their responsibility within creation, and their duty towards nature and the Creator, are an essential part of their faith’”. “I welcomed the recent encyclical of the Holy Father Francis: Laudato si’ – On the Care for our Common Home. Pope Francis’ significant encyclical reminds us of our common humanity and our part in the whole of creation. I think this is a due reminder to us all of the responsibility that we have towards one and other and the whole environment and its well-being. To have a love for humanity is to have a love for the environment and to have a true love for the environment is to love humanity. The Pope calls us to have an honest look at our lifestyle and to see in which areas we need to change. Two areas he points out is the waste of food, and the suffocating of our sensitivity towards others, which can arise through consumerism. Laudato si is Pope Francis’s Encyclical Letter on “The Care of Our Common Home”. Released on Thursday, 18 November 2015. Laudato si is Pope Francis’s Encyclical Letter on “The Care of Our Common Home”. This 10-page summary – a map – serves as a useful guide for an initial reading of the Encyclical. 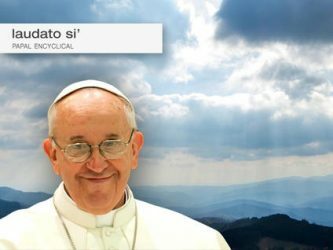 Carmody Grey is a Doctorate student at Bristol University, she explains what she thinks of the Pope’s message and how, as a young person, it will impact on hers, and other young people’s lives. The final podcast is by Jane Critten. As a mother of five young children., she explains her hopes for the future and how the message from Pope Francis will help her in her family life and how this could make a better place to live for her children in the future.